First of all, thank you so much to everybody who called, commented, emailed, etc regarding my last post about Fig. I really, truly appreciate it. Fig is now the size of a peach. 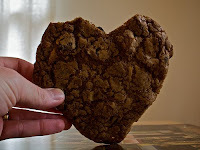 1) The whole thing started off on Friday with a surprise delivery of 2 gigantic, home-made, heart-shaped cookies, accompanied with a note that read, “Happy V-Day.” Sources neither confirm or deny it, but I am 99% positive that our mystery benefactor was none other than Gutzville. Thanks guys! 2) On V-day morning, I had a request to iChat from none other than Leda. Yes, Leda! Leda in Nicaragua! She never ceases to amaze me. She probably spent nearly 30 years of her life having never touched a computer, but now that she’s got access, there is no stopping her. It was amazing to be talking to Leda in real time! And also difficult, given the rustiness of my Spanish. But we made it through. I had sent her an email earlier telling her the news about Fig, and she was very surprised! She is so happy for us and can’t wait for us to bring the baby to Ometepe. She asked me to send her pictures of my belly, and I told her to wait—it still just looks like I’m getting fat, but hopefully one of these days you’ll be able to tell that there’s an actual baby in there. 3) For Fig’s Valentine (and maybe for Rob’s Valentine), we went and test drove a Prius. I know, I feel like such a yuppie. Urbana is thick with Priuses. It’s beyond cliché. We stand out as the sole, proud owners of a Honda Insight that gets at least 15 mpg better than the Prius. But unfortunately our car Iris only has 2 seats, and there would be no room for Fig. So we’re going to have to get a new car. Rob’s handling all the research on this one (I’ve got my hands full with research on cloth diapers), and he’s determined that the Prius is our next best bet. To me, the Prius seemed too fancy for riff-raff like us to sit in, much less drive, but he loved it. Aside from the arrival of a new camera, computer, or bicycle, I have never seen Rob so talkative and happy. So if anybody is interested in a gently-used, well-loved, 2002, silver Honda Insight, let us know. We’ve got to sell Iris to make room for a Fig-friendly car. You may just have to pry me out of Iris’s seat on the day of the transaction, though. 4) Valentine’s Day concluded with me getting to have a special dinner that didn’t even make me feel sick. Sushi! Now, before the Baby Police* handcuff me and take me away, warning me of the dangers of raw fish and mercury, let me point out that I’m Melissa… I’m a vegetarian, and I would never dream of eating fish (either raw or cooked) regardless of whether or not I was pregnant. Last week, I went out with the girls to Yellowfin restaurant and had sushi for the very first time. With my sushi-expert girlfriends to walk me through the menu, I discovered that there were plenty of vegetarian things that I could eat—even with my pregnancy-addled taste aversions. I ended up getting some “AAC Rolls” (with avocado, asparagus, and cucumber). Dipped in wasabi with soy sauce, and chased by a strip of pickled ginger, this was quite possibly the best thing I had ever tasted in my entire life. For the first time since Christmas, I felt good! It was amazing! The only downside to the sushi adventure is that literally, all I have wanted since that night, is sushi. I woke up the next morning and wanted sushi for breakfast. I still wanted it for lunch and for dinner the next day and the day after. Unfortunately, Rob flat-out refused to go have sushi with me—which is probably a good thing, since it’s not cheap. By last night, my desire to eat those AAC rolls had become unprecedented. Plus, a friend had mentioned that some pregnant women find pickled ginger helps to relieve morning sickness. Could it be that it was the pickled ginger that had helped me feel so great after sushi night? I simply had to find out. Luckily, Yellowfin does takeout. So I placed an order for AAC rolls, and just about ½ hour later, I was eating them. Sublime. I even got Rob to try one of the rolls, and he actually liked it, so there is hope for more sushi to come. The pickled ginger may have helped for a little while, but I actually felt pretty cruddy for the rest of the night. I’ve come down with a rotten cold, but I’m trying to look on the bright side. At least I can’t smell things as strongly while my nose is plugged up. Anyway, sorry for another excessively long post. 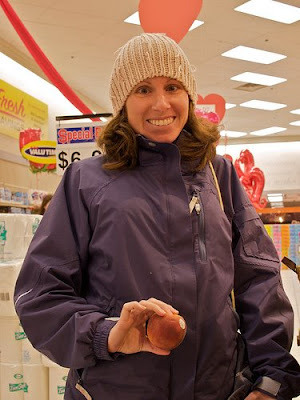 Now that I’m back to regular blogging, I’ll get these posts short and snappy in no time. *The Baby Police are an amorphous blob of people who warn pregnant women and new mothers that anything and everything they do will harm their babies. Ninety-nine percent of these things are things that our mothers did when we were young, and look at us, we turned out fine. Eating sushi was actually probably not one of those things that our mothers did, though. I was at Am-Ko this morning too! They sell jars of that pink pickled ginger for only ~$3 or so. Hope you saw them and picked one up! i think pregnant people in japan have been eating sushi for centuries. Those do look like delicious cookies. 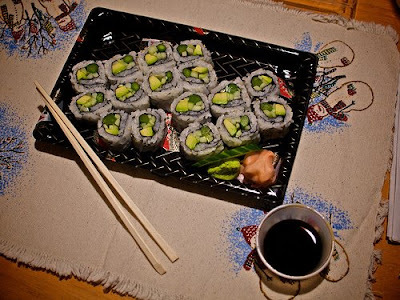 You guys will have to come over for sushi some time and we will teach you how to make it for cheap, and it is especially cheap and easy if you it does not have large fish from the sea. I admit that I have never tried sushi before, largely because I stereotype it as involving raw fish. The one that you just described sounds really good though. I may have to give it a try.